The Italian government says it will not sign up to an EU plan for tackling illegal migration to Europe if it does not make help for Italy a priority. The leaders of 10 member states plan to meet in Brussels on Sunday in a push to tighten border checks and stem the flow of non-EU migrants inside the bloc. Four Central European states - critics of EU policy - will boycott the talks. Italy is now the main arrival point for boatloads of migrants - mostly Africans fleeing chaos and violence in Libya. 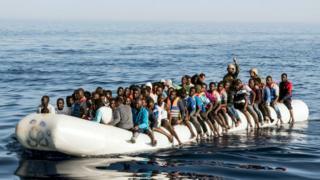 But Italy has now refused to let in 226 migrants rescued by the German charity Mission Lifeline off Libya. And last week Italy's refusal to let in 630 migrants aboard the rescue ship Aquarius triggered a diplomatic row with France. The new Italian government accuses charities of undermining EU efforts to curb the influx of migrants. "We need help now," Italy's right-wing Interior Minister Matteo Salvini said. "If we are going to Brussels to receive the HOMEWORK already prepared by the French and Germans... the prime minister would do better to save the cost of the trip," he tweeted. Is Italy taking in thousands of 'non-refugees'? Med migrant crisis: A mess - or cynical politics? Where are the tensions in the EU? Sunday's talks come amid serious divisions in the EU over migration and asylum, overshadowing an EU summit to be held on 28-29 June. The Visegrad Group - Poland, the Czech Republic, Slovakia and Hungary - refuse to take in any refugees from Italy or Greece. Hungary's Prime Minister Viktor Orban said Sunday's summit was "against the normal customs of the EU", so the Visegrad Group would not attend. Earlier it appeared that Italy too might boycott Sunday's talks. Mr Salvini's warning was prompted by the leak of a draft declaration which, according to Italy's Prime Minister Giuseppe Conte, has now been withdrawn. "I just got a call from [German] Chancellor Angela Merkel, worried about the possibility that I might not attend," Mr Conte wrote on Facebook. "The chancellor clarified that there had been a 'misunderstanding'. The draft text released yesterday will be shelved." The migration issue is also threatening Germany's coalition government. Bavarian CSU leader Horst Seehofer backs the tough stance adopted by the Visegrad Group and Austria. A long-time ally of Chancellor Angela Merkel, he objects to her "open door" policy which let more than a million asylum seekers enter Germany in 2015-2016. Mr Salvini, a Eurosceptic, heads the anti-immigration League party, which accuses the EU of leaving Italy to struggle with an unfair burden of asylum claims. Prime Minister Conte says measures to curb the flow of migrants to Italy from North Africa are the priority - not transfers of migrants from one EU country to another. The EU also aims to beef up its Frontex border guard force to 10,000 staff by the end of 2020. The EU's controversial Dublin Regulation states that an asylum seeker's claim should usually be handled by the country where he/she first arrives. The regulation - currently under review - enables EU countries to deport asylum seekers to the country where they first landed. Italy and Greece object to that policy, saying they are shouldering an unfair burden.